In the race for “potential solutions through blockchain technology”, healthcare is a primary example of a top contender. If stateless protocols are placed, electronic health records (EHRs) and blockchain should go together like peanut butter and jelly. Maintaining a secure database with verified data is an integral part of EHRs, as such, this technology can provide a large security and efficiency boost in healthcare. Although this industry, like many, is seeing proof of concepts happening at an increasing rate, we want to also expand on the limitations of blockchain in healthcare while we grow on the greater possibilities, as to give you a clearer picture of the extent of its possible implementations. Although good healthcare systems are present in most developed countries, healthcare expenses are extremely high, and the procedures of most healthcare systems are very complicated and vexing. In this blog post, we’ll be exploring the United States healthcare system for it's very obvious flaws. 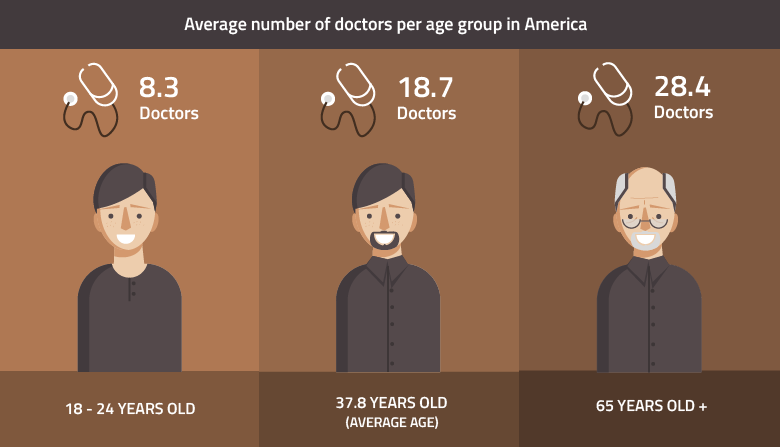 The average American (age 37.8 in 2015) visits 18.7 doctors. For ages above 65: 28.4 doctors on average. From ages 18-24: 8.3 doctors on average. The constant switching of doctors is detrimental for a proper quality service because having a single doctor who can get personally acquainted with a patient makes it much easier to identify hidden issues. An average a doctor’s appointment took 13 pieces of paper. 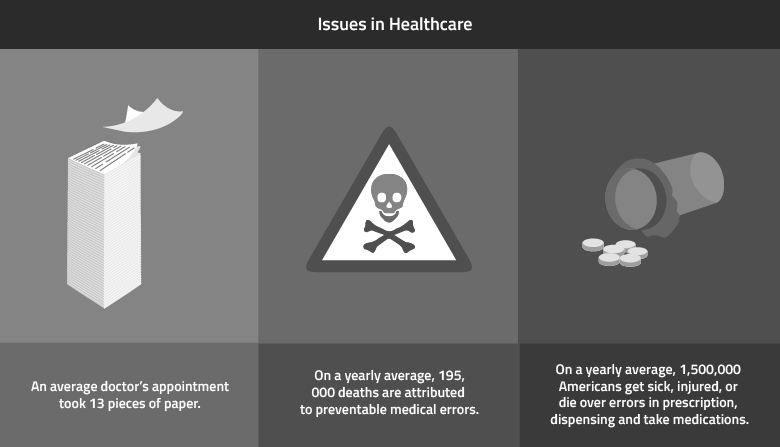 On a yearly average, 195,000 deaths are attributed to preventable medical errors. On a yearly average, 1,500,000 Americans get sick, injured, or die because of errors in prescription, dispensing and taking medications. In 2015, the budget was $3.2 Trillion USD, which accounted for 17.8% of the GDP. The spendings on Medicare were $646.2 Billion USD and the spendings on Medicaid were $545 Billion USD. Administration costs for healthcare were $361 Billion USD. This also has other implications. For US citizens it means that in 2007, 62.1% of all bankruptcies filings were made because of medical-related expenses. Not to say that the healthcare system is crumbling or collapsing, but there are serious roadblocks. The ramifications of not advancing into newer systems are pretty obvious: the costs will only continue to rise, the administration will become more of a hassle, and patient satisfaction will continue to fall, until the eventual plummeting of it. The previously mentioned reports and statistics were hefty, but they are there for a good reason. First, they are there to give you a crystallized view of the issues that are implied with a traditional paperwork-loaded system running in the 21st century, fast paced world. Most of all, through giving you the bigger picture you begin to see a pattern in which blockchains can integrate itself into different industries. A blockchain is nothing but a digital ledger - a framework for saving and organizing data. The implications of it though are massive. The primary attributes of the technology are that it is immutable, decentralized, and fast, while also offering centralized forms. These traits make it readily available and very powerful in many industries and not just healthcare. Although the technology could have other applications in healthcare, the two we’ll be discussing, which are possible Proof-of-Concepts, are smart profiles and data interoperability, two subjects which interconnect. The biggest problem healthcare systems have are with electronic health records (EHRs) and their data forms. This is because of many healthcare institutions, whether they are public hospitals or private doctors, use different frameworks for saving data. Part of the American Recovery and Reinvestment Act (ARRA) of 2009 declared that healthcare institutions are required to install some form of EHR/EMR starting from January 1, 2014. Those who fail to comply within a year will receive a fine of 1% reduction in Medicare reimbursements in 2015. This increases by another percentage per year, to a cap of 95%. Although this stimulus package did succeed in pushing its EHR agenda into healthcare, it failed in creating a uniformed data framework which created data fragmentation, instead of the aimed cohesion. Blockchains, like in their possible uses of identity management, can be used to create a smart profile for patients. This smart profile can contain all the health data of a person. The profile can be created by an institution and can be maintained by the patient himself, with certain entities, such as doctors, having access to them. Smart profiles can also give power to the patient, with him being one of the very few entities that have access to that profile through the use of private and public keys. This gives the patient the ability to choose what he shares and with who, holding back on any information that one deems unecessary to sharing. What does a smart profile mean besides the obvious previously mentioned traits? It also means data integrity, some form of interoperability and benefits on the current issues of healthcare, such as administration costs and Medicaid reentry. Firstly, in healthcare, data integrity is crucial because when “testing the waters” with a new technology in health data, we are at the core of sensitive personal data and there’s no dilemma over the importance safety. Blockchain immutability is one of the key factors in this; projects such as Google’s DeepMind wanting to build auditing systems for healthcare being very important contenders. Data entered into it has the advantage of permanence. Other than permanence, the digital ledger provides us with better versioning which allows us to have a genesis of the data, allowing us to see the timestamp of the creation and editing. These traits make blockchains an optimal solution for the issue of data trust, but also providing us with versioning which is a critically important attribute. Data integrity and versioning can have a large impact on health research, providing a framework for 100% accurate data can open the path to extracting more insightful research data, which can help advance the fight against many preventable diseases. Because the patient can have control over his profile and the data on it, participation in medical studies can be easier, since the patient can have easier consent for sharing his personal data and actually see what data is being shared. In addition to that, blockchains can help create data interoperability through the use of smart contracts and tokens. A token can have two states: “YES” or “NO”, and through applying tokens in forms we may be able to come to some form of interoperability. The possibility of partial interoperability is far greater than the possibility of having one single static way of data entries. Many things prevent this from happening and any guesses of how this would happen are, for now, simply ad-hoc. Finally, we come to the complications of administration costs and reentering in health care programs. As we previously mentioned in the statistics, the US is plagued by terrible administration protocols. The processes are bloated, consume a lot of time for both parties, patients, and doctors, while causing dissatisfaction on both ends. The patient could have changed his current job, switching to a job that pays more, this changes the conditions of how viable he/she would be for Medicaid benefits. The system can then send an SMS to the patient, asking to confirm whether or not he/she wants to reapply for Medicaid benefits. The confirmation could then be saved within the blockchain, which lowers the large time and money consumption of having to go through current administrative settings. Healthcare is a largely problematic industry because of the sensitivity of the data that is being worked with. Although not the only issue, this is, by and large, the most debated issue when it comes to implementing blockchains in healthcare. The issues on private key loss or thieving are the setback. Although present with these issues, proof-of-concepts are proving to be very promising, which gives us hope for the healthcare industry to provide a more qualitative service.